Waterpik is a must buy because it makes flossing easier and convenient and does a better job than the normal flossing. If you are one of those looking to improve the health of your gums and teeth, Waterpik is a great investment for you. Are you battling with braces? Do you have bad breath, excessive and stubborn plaque? Do you have pain or bleeding as a result of using the traditional method of flossing? Or do you suffer from gingivitis? If your answer is yes to one or more of these questions, then continue reading this Waterpik Ultra Water Flosser Review because it is particularly for you. Waterpik Ultra WP-120 comes with amazing features that will offer you value for your money. Here are some of what you are buying when you invest your money in this product. All the available Waterpik models feature adjustable water pressure settings. However, the control and degree of force (pressure) differs between different styles and models (WP-120 offers 10 water pressure settings). Regulating the pressure setting of the Waterpik lets you manage the pressure or force of the water discharged from the cleaning tip. If you are a beginner to using a Waterpik it is suggested that you should begin with the lowest setting and steadily increase the force to your preferred level for a period of a few weeks. A number of Waterpik models encompass universal voltage supplies; meaning that they are appropriate for worldwide use. These models are – the Traveler (WP-300), Kids (WP-260), and Cordless advanced (WP-560). Other available models are just appropriate for use in the countries where you bought them. For instance, the Water flossers in the UK are just appropriate for use with 240 VAC/50Hz, while the ones in Canada and the United States only well-matched for use with 120VAC/60Hz outlets. The reservoir holds water and it is powered by an electric motor connected to the pump. Water from the tip runs from the reservoir and used to clean food debris and bacteria. The quantity of water in the reservoir differs based on the model. 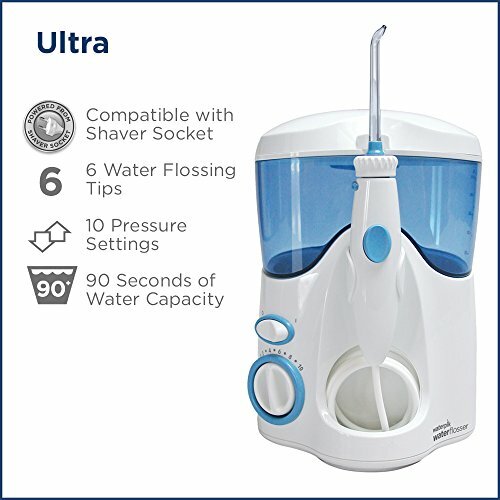 Ultra WP-120 offers 90 second of reservoir capacity, which is more than enough for an excellent flossing. This is an on and off control switch located on the handle to suspend water flow for additional ease of use for the advanced countertop water flossers units. The models that come with handle control – Waterpik Complete Care 7.0 (WP-950), Waterpik Complete Care (WP-900), Waterpik Aquarius Designer Series (WP-672), (WP-674), (WP-676), Waterpik Aquarius (WP-660), and Waterpik Ultra (WP-120). This is the feature that pauses the process of operation of the Waterpik Ultra Water Flosser at 30 seconds (to inform the user to move to the other half of the mouth) and also at one minute (as a signal, that the suggested one minute flossing time is over). A lot of Waterpik Ultra Water Flosser reviews suggested beginning with the lowest setting at the very first time you use it. Waterpik is very easy to use and it is no brainer for any beginner as well. You can clean your teeth the way you want with the different tips that come with Waterpik, irrespective of your situation. Waterpik is user-friendly because all its features have been simplified to clean far more food particles and plaque your teeth than the standard flossing method. For instance, the pressure control dial of this product is being precise, easy to use and responsive. Waterpik makes your mouth exceptionally clean and fresh with healthier gums in 14 days. Eliminates bacteria deep under the gum-line and between the teeth where traditional flossing and brushing cannot get to. Great for people having veneers, bridges, crowns, and implants. Noisy and can easily wake people in the house up if you choose to floss late in the night or very early in the morning. Flossing every day with Waterpik Ultra Water Flosser before brushing is the best to get a totally clean and fresh mouth. It is the simplest way to floss and get a cleaner, fresher, and healthier mouth. The product is also ideal for you if you have periodontal pockets, crowns, or implants. You will discover that there is no list of benefits to making use of an oral irrigator because it only needs to eliminate plaque and clean the difficult to penetrate areas of your mouth without causing irritation or bleeding. As you could see in this Waterpik Ultra Water Floss review, Waterpik is surely a must buy because it makes flossing easier and convenient to do and even does much better job than the normal flossing. If you are one of those looking to improve the health of your gums and teeth, Waterpik is a great investment for you. Waterpik Ultra Water Flosser is recommended for you to buy!